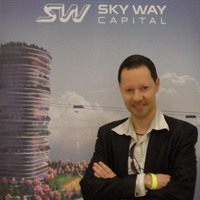 Sky Way is an elevated over ground high-speed,urban and cargo transport system in which traffic is arranged on a track structure made of specially designed pre-stressed rails that are stretched between anchor supports.The rolling stock speed can compete with that of the airplane and its traffic is controlled automatically. Sky Way technological advances the aim to solve ever-increasing transport problems such as traffic jams and consequently increased travel time,eliminate heavy mortality as a result of traffic accidents and avoid deterioration of the ecological situation. Duyunov hub motor is the first in the world induction motor with "Slavyanka" winding that has a unique combination of work capacity and power consumption.The new technology is based on the developed innovative technology of combined motor winding (a star and delta winding combined parallely).Thanks to the combined winding the parameters of the hub motor are significantly improved and energy efficiency is enhanced.